The luxurious wall-mounted GROHE Grohtherm 3000 Cosmopolitan Trim set in Cool Sunrise – sophisticated style meets showering performance! With its circular design and cylindrical handles in Cool Sunrise this beautiful trim set in Cool Sunrise is a real eye-catcher. The system is also packed with GROHE’s cutting edge technology. The AquaDimmer diverts the water smoothly from the bath inlet to shower or head to hand shower. The integrated GROHE SafeStop button prevents users from turning up the temperature too high and the EasyLogic markings are very simple to follow. 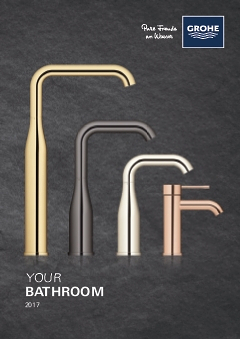 And it’s easy to upgrade your bathroom with this attractive trim set because the GROHE QuickFix system ensures it can be installed in the blink of an eye. The trim must be installed with the GROHE Rapido T concealed thermostat (35500000). Engineered with the GROHE TurboStat technology, it instantly delivers the selected water temperature and keeps it constant throughout the shower even if the water pressure changes. Part of our new Cool Sunrise bath collection, it looks great, delivers a wonderful shower experience – a classic GROHE product!